It so happens that your favorite pants are worn out or fed up, but sit perfectly and get rid of them sorry. In this case, with minimal sewing skills and unlimited imagination, you can make old pants into a skirt. 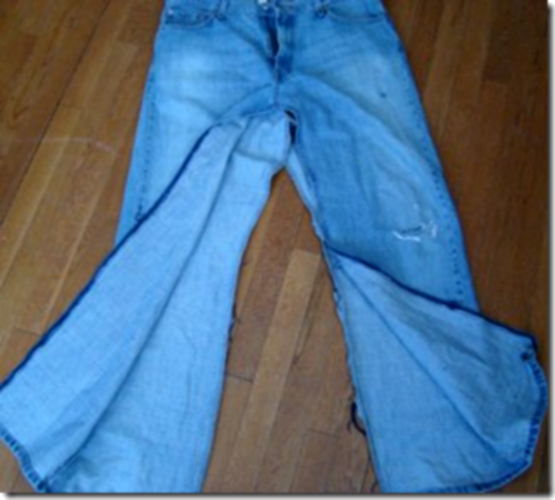 The easiest way to alter tight denim pants, as jeans are quite durable and not difficult to process fabric. Strut stepper and medium seams and remove all the crawl thread. Wash and dry old jeans. Outwrite the resulting workpiece through wet cheesecloth. All frayed seat seams it is desirable to cut off, otherwise in a new product, they risk to unravel after the first washing. You can cut the excess fabric from the seam or putting one detail to another, just sew them. If the width of the skirt after that will not be enough, you need to insert a wedge. Determine the length and model of the future skirt. Lay the workpiece on the table. Sametime and run the middle seam. If the skirt is quite short and it is planned, will be sufficient to cut off the leg and treat the lower cut (be sure to leave 2-3 cm at the finish). Can also fluff up the denim hem fringe, sew flounce, braid or lace. If you plan to make the skirt long, you need to insert a wedge. It is possible for this purpose to carve out pieces of the cut leg or to choose a different fabric. Wedge looks like a triangle. Well look panels of translucent fabric, linen, corduroy or velvet. Take a wedge of the desired size. Vmlite it and try the product. 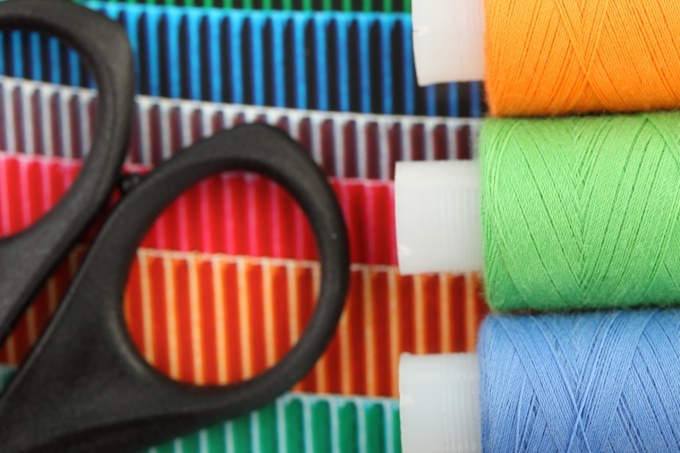 Sew seams and finish on the serger or stitching "zigzag" edges. If the skirt turns out narrow, be sure to leave the slits. To perform them on your side or on the front of the skirt. The edges of the incisions treat the lace or decorated with fabric from which you cut the wedge. Can decorate the resulting product with embroidery or braid. Optional pristrochite on fabric applique, embroider the ornament with beads or ribbons. If the fabric has bald patches or spots, close them by drawing using special paints for fabric. Better take to redraw the zone because it is quite difficult, and not every machine will be able to stitch the denim a few additions. If you decide to do it, it is better not vsuite new belt, and make the skirt on the hips without a belt at all. Old, boring jeans – the perfect material for a beautiful new skirt. You only need to choose the model and correctly calculate the available fabric. Strut jeans on the inside leg and crotch. Cut the waistband in the back. Circle on graph paper each half of the workpiece. Locate the pattern. the ideal would be a straight skirt or pencil. Apply the pattern on the same graph paper on top of the material. Check the excesses and deficiencies of the fabric, divide the pattern pieces. Break the pattern pieces on fabric (for the borders of the missing pieces), cut out and mount on old jeans. Sewn details. Cut length and other surplus subject to the seam 2 cm from scraps to make additional, previously cropped details. Frayed edges to the fabric is not disbanded and had even from the inside the presentation. Baste the skirt, including the waistband. Try. If the skirt sits well, sew the seams on the machine. Garnish with applications. The zipper of the pants would serve on the skirt. Skirts are an important part of the female wardrobe. If you wish, you can Supplement your wardrobe with a new designer skirt, which is easy to sew the most, if you possess basic knowledge in tailoring and sewing. 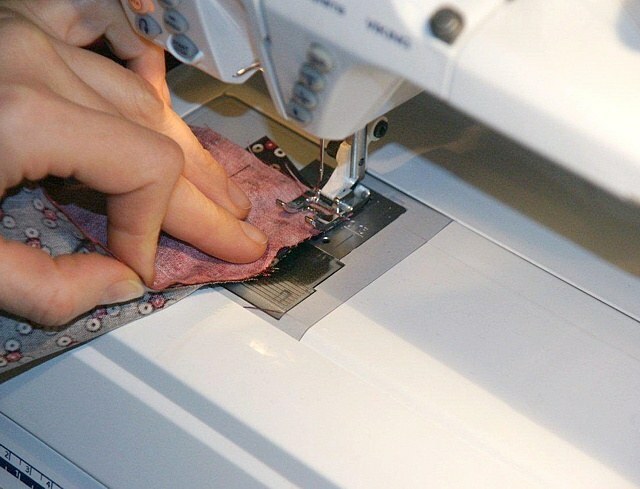 The easiest way to sew a skirt can alter the pants. Take pantsthat you would like to sew a skirt. It may be outmoded styles or jeans, the pants that you are wearing and throw them away, or simply worn out places and worn pants. Cut the pants to the length you want to skirt. Strut interior seams of both legs. The side seams of the legs to strut it should not, because they will serve the same skirt seams. Sew on the sewing machine between the two front parts of the legs ripped. Do the same with the two rear parts. Thus, you have a skirt with four seams: two side, front and rear. To hide the front seam, decorate it. These can be buttons, embroidery, ribbons, lace, etc. There is another, more laborious method of altering the pants to a skirt. Carefully cut the top of the pants, which later becomes the yoke of the skirt. The edges of the cut out on the yoke with overlock stitching or replacing it. Prepare a piece of cloth, which, in your opinion, suitable in color to the yoke. He will continue to serve as a flounce skirt. This piece in width should be half an inch wider than the yoke, the length of the future shuttlecock define themselves. If you want to sew a short skirt, prepare one piece of fabric. For long skirts, prepare three future Shuttle, the width of the subsequent flounce should be twenty inches more than the previous. Treat upper cut edge that will be sewn to the yoke with a serger or stitching to replace it. Then a seam "forward a needle" keen, the top of the flounce, gather in pleats, gently tightening the thread with which you made the outline. Folds evenly. Ensure that received, in the end, a circle of shuttlecock, coincide with the circumference of the yoke. Remove the yoke and flounce on the wrong side and sew both parts to each other on the sewing machine. The seam turned out neat and part of the product SSRIs between them smoothly, before you sew them by machine, baste the frill to the yoke with a needle and thread. Gently treat the bottom edge. You have a short skirt. If you want to sew a long skirt, follow the same steps with the next two ruffles. Skirt this style looks great when the yoke is made of jeans, and the ruffles matched in tone or made of a material of pastel shades. 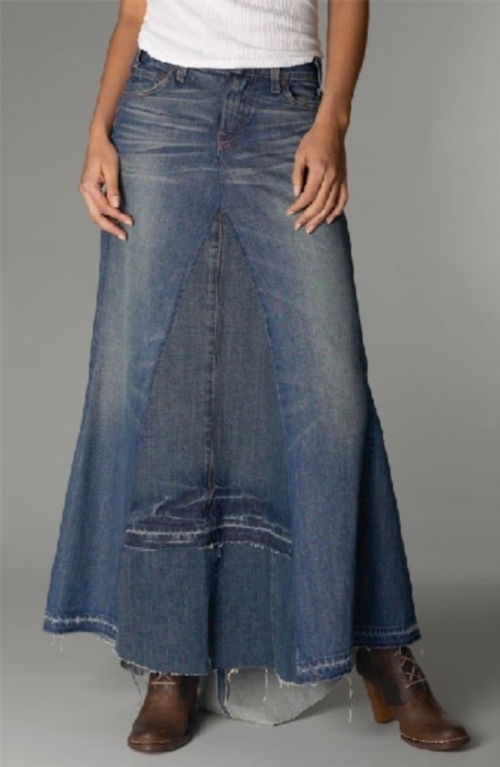 Every girl in the closet bound to have jeans clothes, such as skirt. every owner always asks the question: "How to make my thing was unique?" In this article, I'll show you how simple and creative you can decorate a simple denim skirt so that she was fashionable and beautiful. Sewing the skirt yourself, you will be fully confident in her uniqueness. You can make her scythe, torn or come up with your style. 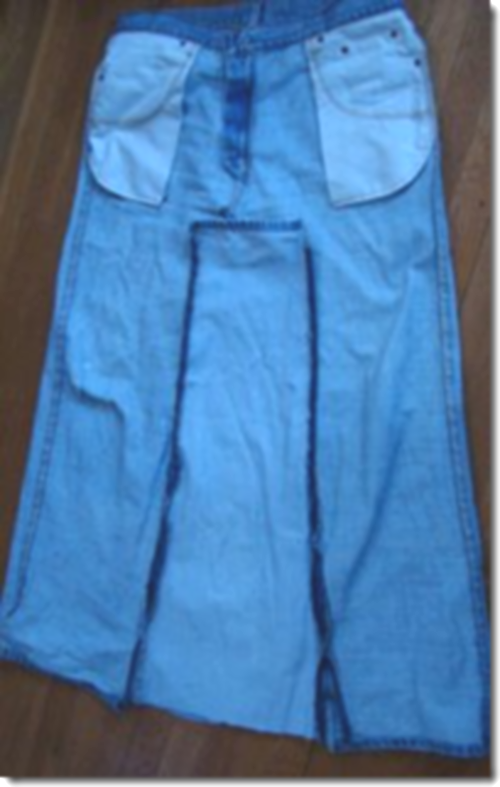 It is easy to do if you have a simple denim fabric. Of course, this stuff is hard to find, but a denim skirt you can make from old jeans material, for example, shorts or pants. They just need to cut in the right places to fit the pattern and sew together. As you know, lace is a romantic element of decoration of clothes. Obviously the use of lace as a decorative items in denim skirts that provides a very wide scope to implement their ideas. Skillfully using the color of the lace and the accessories can be created as a gentle, innocent images, and more bold, brash and causing models. Although you can try to form and custom, but still business image. The biggest problem associated with old UK, is that they end imagepost bored. Even the most favorite skirts after some time I want to change it or at least update. If you throw a pity strange skirts, use the following tips for their trouble. As you know, the skirt is the only garment, holes which will not look indecent. On the contrary, many owners of the skirts I love to tear the skirt. Surprisingly, holey skirt looks always very stylish. The first option is the application. Today, there are a huge number of pictures of different structures and colors. Depending on the color jeans, you can choose leather or fur of an application, drawings or just an abstraction. If none of the applications in the store does not suit you, you can safely draw your own or just copy it from a favorite magazine, newspaper. In order for the application was sitting firmly on the fabric, need to stitch it with thread in the color of jeans), or safely stick, walking up the iron on the surfaces on both sides. 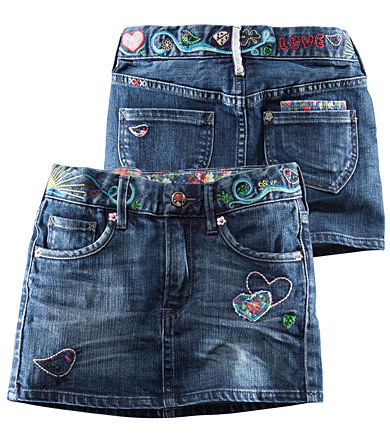 The second option is the perfect decoration denim skirt pattern, embroidered thread. It is, of course, is much more complicated first, and is suitable only for those girls and women who love and know how to embroider, because it is necessary not only to translate the pattern on the jeans, but then gently and embroider it any thread. But for the true professional it will be easy – just half an hour of work and skirt Shine with new colors. And the latest version of the design of denim skirts is, of course, beads and rhinestones. A lot of things today, denim is decorated that way, because the idea is fresh and very original. The skirt is beaded also need to plan in advance the picture that will later be sewn. As for toppers, there are as the whole of an application and a separate "drops". It all depends on your preference and taste. Butterflies — stylish item prices. One pair of old jeans you can make a dozen different butterflies that you can sew yourself a skirt. It will look feminine and romantic, but modestly and sderzhanno.